Homepage/Forums/Formatting Tips/Q: What information should I include in a cover page? A: What you include in your cover page depends slightly on which citation style you are using, but the rules are generally the same. Include the title of the paper, running head, the author’s name, institutional affiliation, and an author’s note. 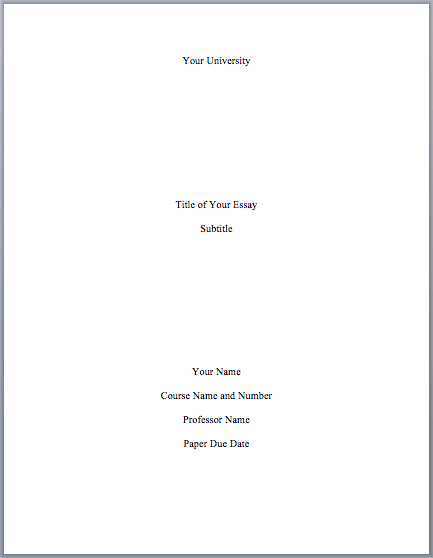 Cover pages are not as frequently used in MLA format, as the inclusion of headers is preferred. Cover pages can include the name of your school, your paper title, your name, your course name, your teacher or professor’s name, and the due date of the paper. If you are unsure of what to include, check with your instructor. For more help making cover or title pages, visit our title page generator here. The forum ‘Formatting Tips’ is closed to new topics and replies.